Be a part of our new unique physics & math book for kids! All Kingdom on the Wall recordings; advanced math topics in algebra and geometry made accessible; cross-discipline experience in physics+math+art; live, active meetings with leaders and participants from all over the world; your name in the book as a supporter. What: A lively interactive online workshop on physics+math explorations for you and your children ages 3 to 12. Topics include center of gravity, symmetry and ratios in algebra, spatial transformations in optics and geometry, and more. Why: Learn how to help your children make bridges between physics, math, and art as they play with rich, beautiful, and deep ideas. Who: A small group of parents, teachers, math circle leaders, and their children, with Dr. Irina Malkin Ondik and Shelley Nash as organizers. When: Live meetings January 19th and 26th 4-5 PM EST (New York) = 10-11 PM CET (Paris). Where: Online video-talk software Zoom (similar to Skype). Price: Registration is $39. That includes eBook of Kingdom on the Wall when it comes out, and your name in the book as a crowdfunder. Work-trade is available upon request. Supplies: Paper, markers, scissors, glue, tape, coins, pencils, a clear glass of water. Missed the workshop? Check out our other online activities! We are running a two-week online workshop for 25 parents, math circle leaders, and teachers with their children ages 3 to 12. 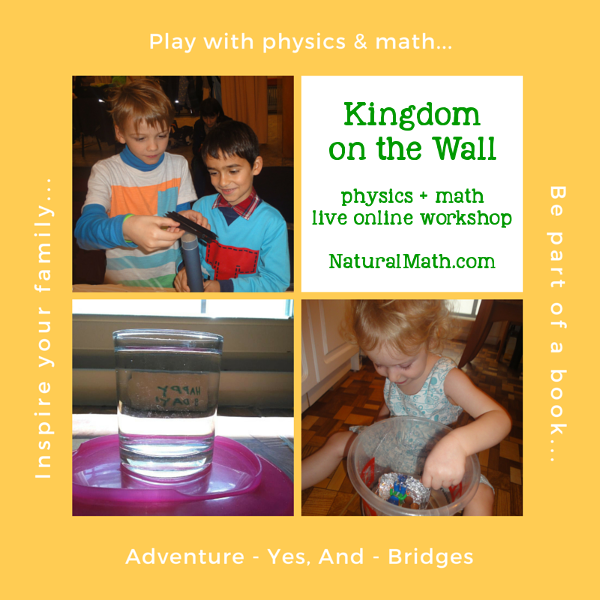 The goals of this workshop are (1) to help adults be comfortable playing with math and physics activities with their children, and (2) to help the author of Kingdom on the Wall beta test the activities in her book. Grow your intuitions for advanced concepts, made so accessible even a small child can enjoy them. The topics of the workshop include center of gravity, symmetry and ratios in algebra, and spatial transformations in optics and geometry. Physics is a chance to explore the wonders of the world around us, together with your kids. It is also a wonderful opportunity to discover math in unexpected settings. For her upcoming book, Kingdom on the Wall, Irina has carefully selected her favorite experiments and games you can try again and again. These activities ignite curiosity in children and adults alike. Join us to play, and gain a new point of view! Participants from all over the world meet twice in an active, face-and-voice webinar. During the first workshop, our goals are to become familiar with Natural Math methods, and to explore math through physics. You can try the activities live, ask questions, and discuss ideas with other participants and the workshop leaders. Between the first and second workshop, you will try out an activity with your group of children or students. We want you to bring your experience back to the second workshop. Bring the successes, the challenges, the struggles, whatever happens we want to know! This will help us improve our activities and the resulting book! The goal of our second workshop is to give you the support, feedback and confidence you need to try out even more experiments on your own. We will discuss your experiences and share feedback and ideas with one another. 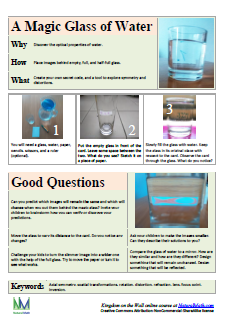 Here are samples of our Physics Sparks – short, sweet explorations that fit on a page: A Balancing Act and A Magic Glass of Water. We’ll have several activities like this to try. Click to see the full-size PDFs and ponder the questions in them. Dr. Irina Malkin Ondík is a science education consultant, mother of three and a huge fan of Science Centers. She loves experimenting with didactic methods, mathematical terms, conductive materials, and all kinds of things in-between. 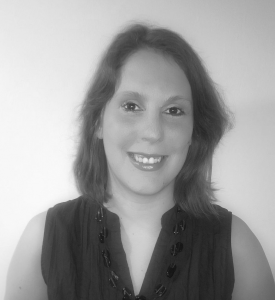 Since 1997, she has been involved in math and science outreach activities for various audiences. Recently she has started a local program of science for families. Bridges is one of the seven Natural Math principles, and the focus of this workshop. BRIDGES connect and unite. 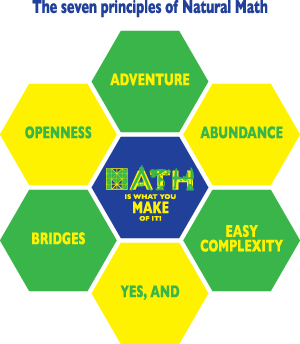 Link math ideas to one another, math to other human endeavors, and people to math-rich communities. Connections help us to make sense of math, and to use math to make sense of life. What do you get from Kingdom on the Wall? 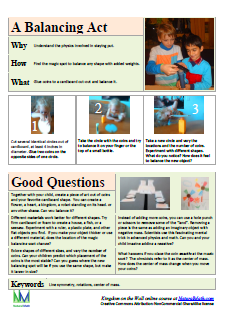 A highly interactive experience where you make experiments, talk, and collaborate with other parents and teachers. Leading your children or students on playful math & physics adventures, such as center of gravity, optics, symmetry and ratios, spatial transformations and geometry. Two meetings in a math circle format to see how to run these activities, and to get inspired. The opportunity to contribute to the book Kingdom on the Wall, and the ebook for you when it is published. Most importantly, you’ll get the confidence in your own ability to play with math and physics in your family!